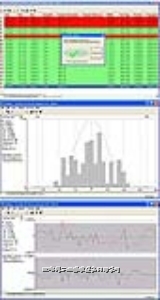 NEXYGEN?/FONT> MT software provides a virtual testing laboratory. The software offers a full compliment of testing categories with multiple test types within each category complying with industry and international testing standards. Setups remain easy and users can fully configure a test using a menu driven approach that guides them in a logical, intuitive, step-by-step manner. Like the other NEXYGEN packages, NEXYGEN MT software presents test results in tabular and graphical formats. NEXYGEN MT also provides enhanced security features and audit trail management facilities for applications requiring compliance with regulatory standards such as 21 CFR Part 11. A unique video capturing feature is also provided so that you can record the test using a web camera and synchronize and embed the visual image with your testing data and graphical results. A Security Module within NEXYGEN MT assists in achieving compliance with 21 CFR Part 11 by supplying enhanced security and audit trail management functions. The Security Module requires Windows 2000 or Windows XP Operating System and can connect to a user-supplied secure database, Access 2000, SQL 2000 or Oracle 9i.